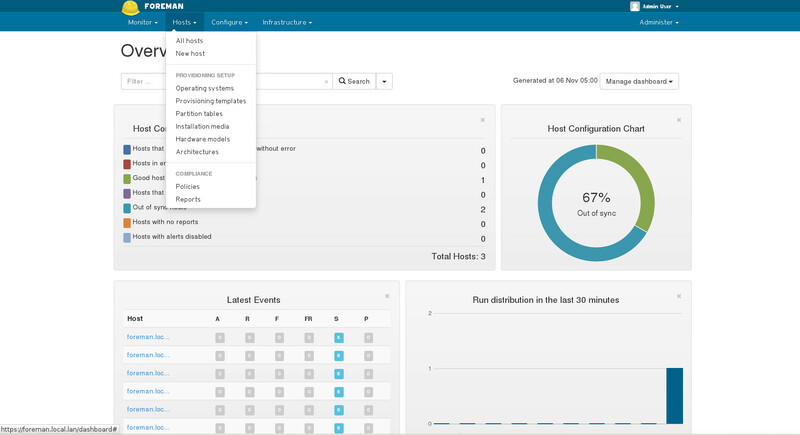 Let's see how the user interface of Foreman & OpenSCAP integration may look like. compliance report of particular asset. 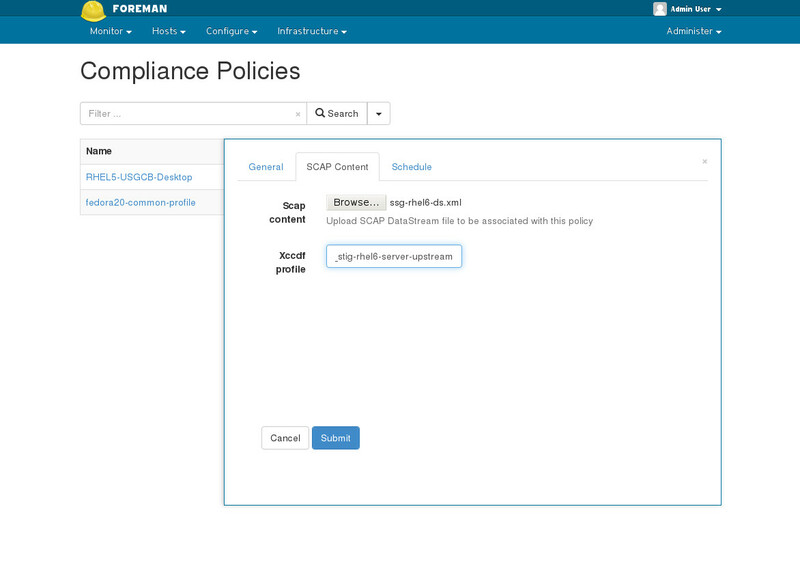 Similarly, foreman_openscap will introduce two new roles to Foreman's users: can edit compliance policies and can view compliance reports. Once the reports are collected from infrastructure according to the policies definition they can be listed and searched. For each report there are a very verbose detailes available. This blog is a reminiscence of my very first blog post here. As well, it is a follow-up on recent introduction of project SCAPtimony. First application of SCAPtimony will be integration with Foreman. Foreman is a complex, web based, systems managing system. It provides life-cycle management as well as configuration management using popular Puppet project. 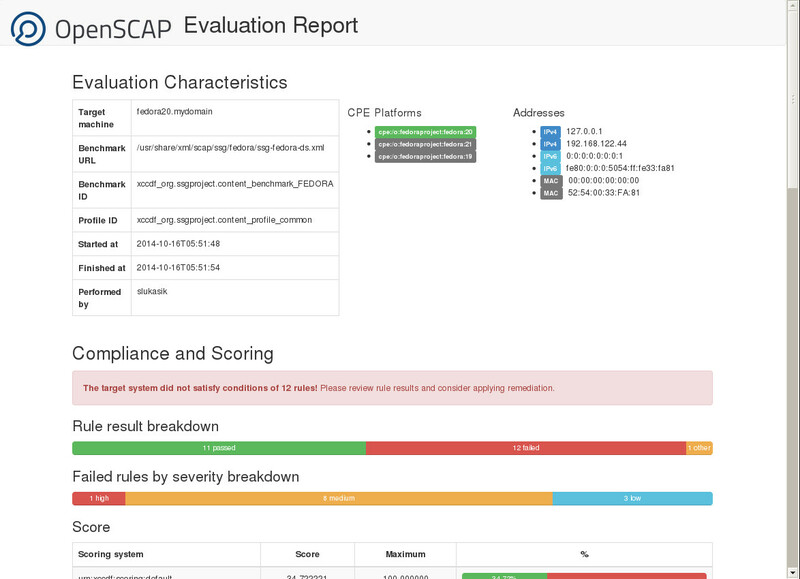 OpenSCAP is open-source implementation of SCAP line of standards. 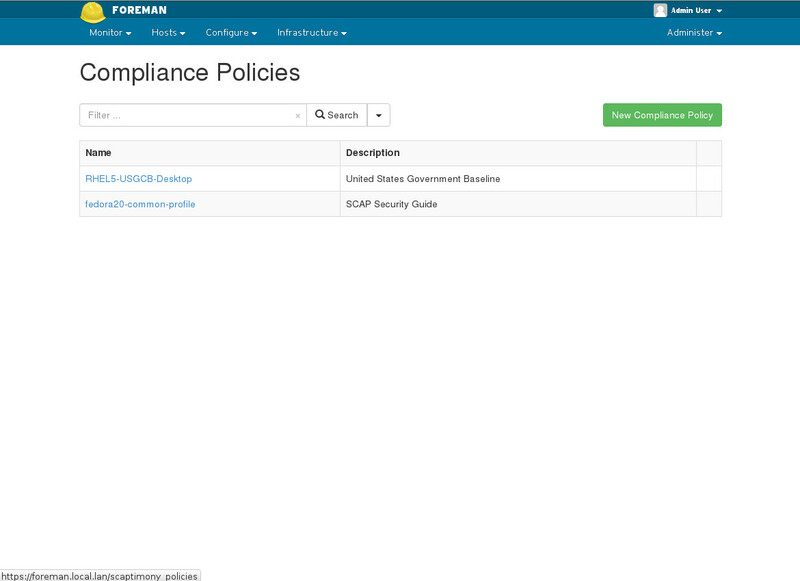 Foreman will leverage broad API of libopenscap.so for manipulation of SCAP files (parsing, modification, creation of HTML reports, etc.). ruby-openscap provides Ruby bindings to OpenSCAP. Or more accurately, ryby-openscap exposes certain OpenSCAP functions to Ruby language using FFI. Since the API of libopenscap.so is quite low-level, ruby-openscap encapsulate data and functions into classes that relate the objects in SCAP standards. Ruby-openscap is still quite light-weight and includes only subset of functionality available in base OpenSCAP package. puppet-openscap exposes SCAP scan operation to Puppet language. With puppet-openscap users can write puppet-modules that will create OpenSCAP scan reports on periodic basis. puppet-openscap also includes a Puppet class that will upload SCAP result immediately to foreman-proxy_openscap. foreman-proxy_openscap is a tiny plug-in for Foreman's smart-proxy. This plug-in exposes single API function for client system: (PUT /openscap/arf/arf/:policy_name/:date) . This is API is approached by puppet-openscap when uploading SCAP report. Client upload is authenticated using Puppet certificates. 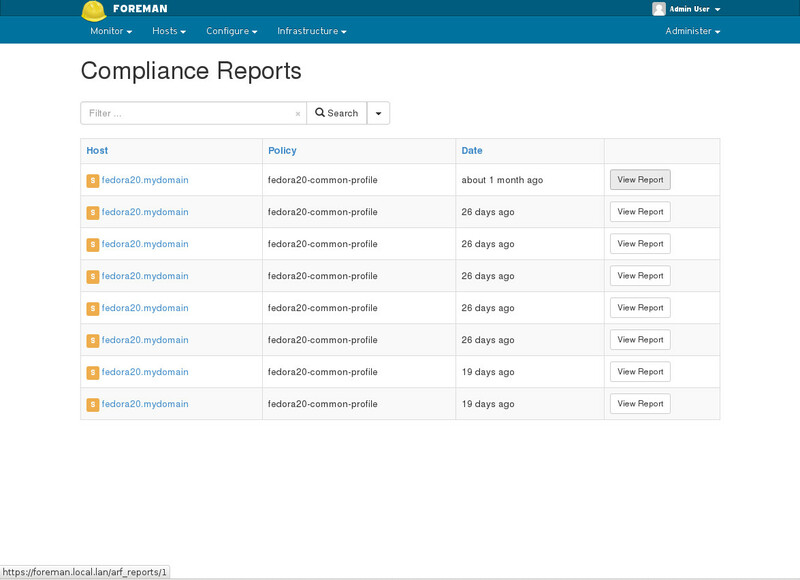 Then, the collection of SCAP reports is forwarded to foreman_openscap. foreman_openscap is a Foreman plug-in (rails engine) that binds Foreman and SCAPtimony together. 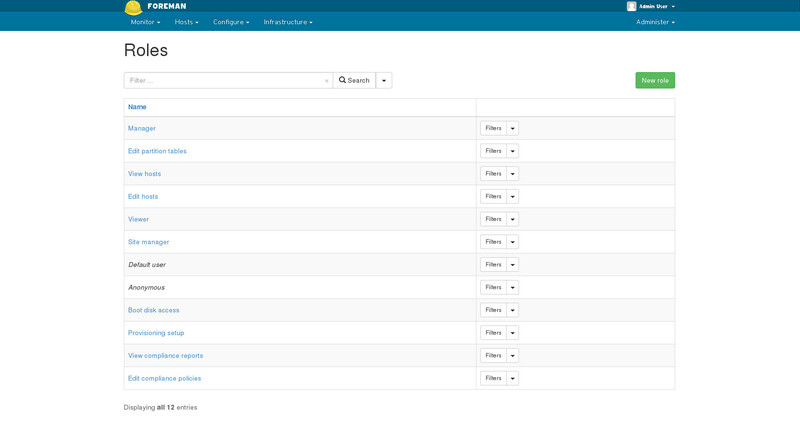 It provides back-end API for foreman-proxy_openscap to upload SCAP reports. 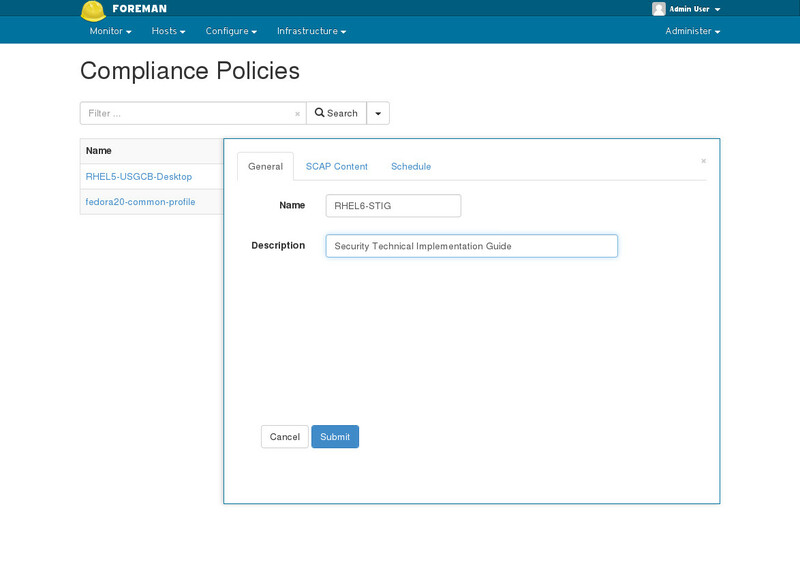 Foreman_openscap also provides user interface. Front-end API for user automation is planned as well. SCAPtimony project has been discussed in recent blog post. SCAPtimony is a mountable rails engine. SCAPtimony is independent of Foreman, however it can be mounted to Foreman. SCAPtimony will enable advanced SCAP operation that cannot be implemented in OpenSCAP package, as they need multiple inputs. This is an introductionary into OpenSCAP internals. After read, you will understand the high-level architecture of OpenSCAP. OpenSCAP project consists of three notable parts: command-line tool, shared library, and the OVAL probes. Let's first take closer look on command-line tool. The oscap is just small binary which makes functionality of the shared available to an user. We are trying to keep the codebase of oscap command as small as possible. Everything oscap does is backed by the shared library, libopenscap.so. The library is logically divided to parts (XCCDF, OVAL, DataStream, CPE, ...). The parts of the library match to the components of SCAP standard. Each part includes parser and exporter code as well as the implementation of algorithms defined by standard. The heart of the library is implementation of OVAL language. That is the part that includes a lot of low-level code to query system characteristics. Library uses special executables: OpenSCAP probes to examine the system. None of the checks is implemented by library itself. When a library evaluates OVAL object, it finds an appropriate probe, executes it and sends the query to the probe's stdin. The probe queries system and returns a result on its stdout. The very compact protocol (SEXP is used for communication. Each probe holds a cache to minimize system load and avoid duplicate queries. In past, we focused to build a low-level API. That means that users of library libopenscap.so are able to build tools on top of the library that may do pretty much everything. For instance an SCAP editor may be build on top of libopenscap.so. On the other hand, when we had this low-level API, it required profound intellectual exercise to write tools on top of it. For example writing simple scanner in C required several hundreds lines of code. That all just to load a datastream, initialize various structures, start evaluation, and export results correctly. There were simply too many options available with the low-level API. Then, we have introduced xccdf_session interface. The xccdf_session interface is recommend starting point for any developer. It allows you to write very flexible XCCDF scanner, despite being abstracted from all low-level decisions. All the magic happens on the fifth line of code. The XCCDF module will build a structure called XCCDF_POLICY that holds an evaluation context. That is the object model of XCCDF file, selected profile, resolved values and handles to OVAL files referenced from XCCDF. The XCCDF Policy then goes through the tree of XCCDF Rules and asks OVAL module to evaluate particular definitions. For each query OVAL module ask particular probe and caches result in form of collected object and module then computes test-result and definition-result. The final value is returned to XCCDF module and forms xccdf:rule-result. This blog post describes a new feature of Spacewalk 2.1 (not yet released) which allows for SCAP results at the server to be deleted. Previously, it was impossible to delete an SCAP scan from Spacewalk, but it turned out that some of the SCAP results loose importance over time and users want to delete them. In general, deletion of auditing results is tricky. The audit may serve as an evidence or may be subject to retention policies. Thus, Spacewalk should not allow SCAP result deletion, unless certain requirements are met. 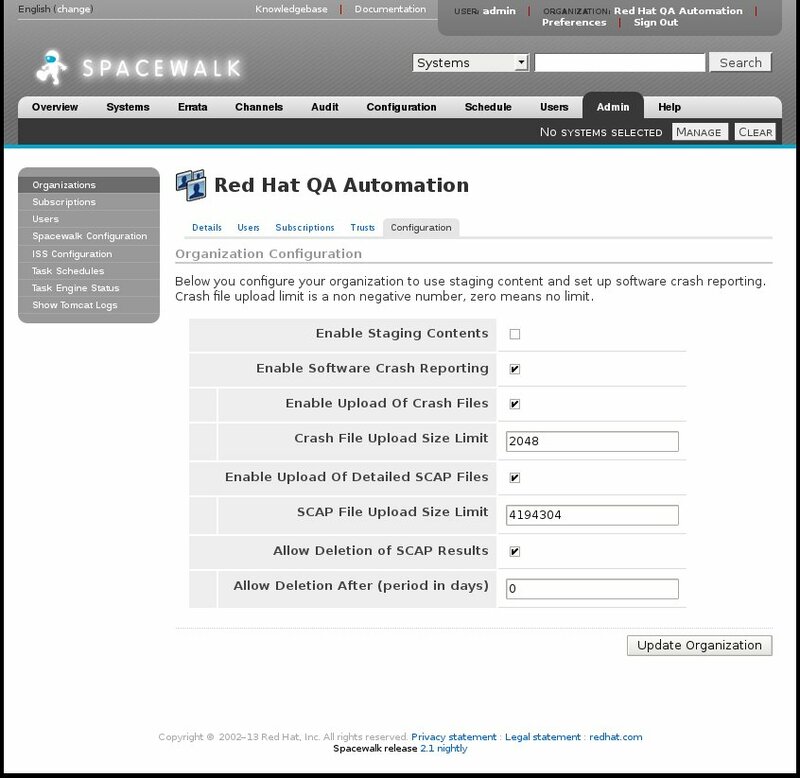 By default Spacewalk 2.1 does not allow SCAP result deletion, until the deletion is configured in Organization Configuration dialog. In the Organization Configuration dialog (shown in figure above), there are two configuration items related to the SCAP Deletion. The first, Allow Deletion of SCAP results, enables deletion for the given organization. This option defaults to off, once enabled it allows system administrators to delete any SCAP results they can see and which has already passed its retention period. The second configuration item, Allow Deletion After, defines the retention period (in days) for SCAP result. If the retention period is set to zero, SCAP results can be deleted immediately upon finish. Once configured, SCAP scan results may be deleted on web user interface or through API (using system.scap.deleteXccdfScan() function). USGCB stands for United States Government Configuration Baseline; according to its web page, it is initiative to create security configuration baselines for technologies deployed across the federal agencies. On 2011-09-30, USGCB released official baseline for Red Hat Enterprise Linux 5 Desktop. This baseline remained the only official guidance for Linux systems for long time. 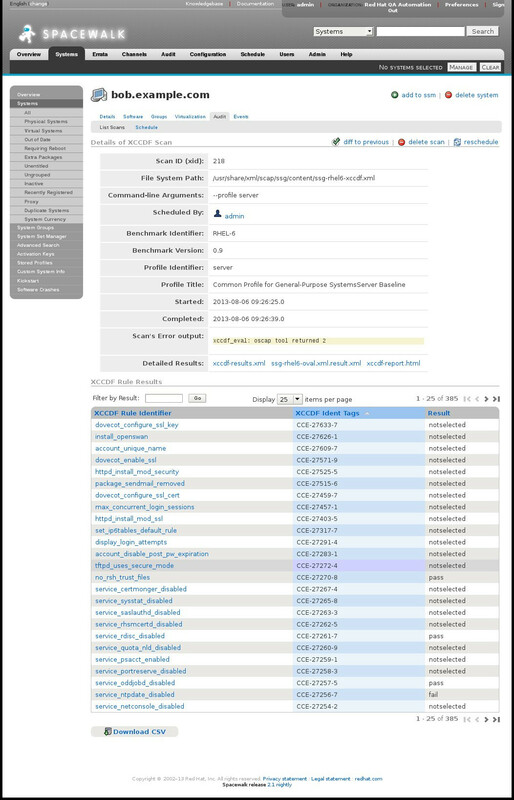 The USGCB for RHEL 5 Desktop, was released in form of SCAP 1.1. In this blog, I will show you how to use OpenSCAP to convert this baseline to a new version of SCAP, SCAP 1.2. Note that the SCAP 1.2 defines new file format (called DataStream) which allows us to bundle multiple legacy files into one huge xml. For this example, we will need the newest OpenSCAP library which was yesterday released as version 0.9.6. First of all, we need to download the baseline from usgcb.nist.gov and unpack it. Now, we have the content prepared and we may start with the conversion to DataStream. The XCCDF document we have uses XCCDF version 1.1, but within DataStream file format, there is only XCCDF 1.2 allowed. We need to convert XCCDF document to the newest version of the standard. We will use XSL Transformations which comes with the newest OpenSCAP package for this task. Next, we will let oscap create DataStream from this new XCCDF. OpenSCAP Error: Could not found file http://www.redhat.com/security/data/oval/com.redhat.rhsa-all.xml: No such file or directory. In the DataStream, there are two components, the first is the XCCDF and the second is its OVAL dependency. We can use their identifiers to evaluate the USGCB. However, in this case, when there is only one XCCDF within the DataStream, we can skip these arguments and let OpenSCAP to find it automatically. Attentive readers must have noticed that in the original archive, there were 4 files, but in the DataStream we have only 2 components. The CPE dictionary was not added to the DataStream during the sds-compose operation and it needs to be added separatelly. We are done. The USGCB baseline is available in DataStream file format. The very same procedure may be used to convert Scap Security Guide into DataStream. However, there might be problems with broken identifiers which time to time appear during the development of SSG.